Highpower Security Products LLC – An American Manufacturer. Highpower offers a premium selection of access control products designed for rugged use in the field. Our selective line of products are designed to be durable and reliable and have proven effectiveness in real world operating conditions. If you require assistance in determining what door access solution will fit your needs, or have questions about specific products your installation requires, please contact us directly at 800-991-3646. We can offer suggestions based on years of experience to reduce your installation requirements and help you plan a strong, reliable installation. Door Access Kits – Our kits are solutions that include all of the items you will need for a code-compliant installation, allowing for quick installations that reduce the hassle. 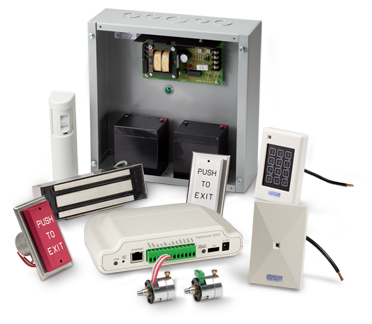 We have a variety of pre-configured kits designed for standard installations and can also create custom compliant door control packages for more tailored requirements. Door Access Controls – Reliable units to implement card access controls, supporting proximity card, barcode or magnetic stripe technologies. Electromagnetic Locks – Installers have discovered that our electromagnetic locks are designed to provide the fastest installation possible, with unmatched reliability. Software Products – Highpower authors advanced software for door access control applications. Our new HMS system is designed to work with all of our access control devices including the HighpowerOne and 3500. We also now carry a Phone App for opening doors for the HighpowerOne, the One Credential. Card Readers – Multiple Technology Card Readers – Readers of any combination of barcode, mag-stripe and proximity cards. Highpower provides several, flexible lines of readers that include stand-alone units, readers that can interface with access control panels, readers that can be networked and units that can be connected directly to a PC. Many of these readers can be managed with our HMS Management software or with included utility software that is packaged with the units. We have readers to read practically any card type, which allows the integration and management of legacy cards into a modern access control system. Door Access Pushplates – The most rugged and durable switches available, our push plates are used as an exit device. Time-delayed versions use Highpower Security’s proprietary, ultra-rugged pneumatic timer designs. Pneumatic Timers – Highpower Security manufactures the most precise pneumatic timers available, ensuring safety and compliance in door access control. Proximity Readers – Our full line of proximity card readers. Readers can be ordered to read Farpointe, AWID or HID brands of proximity cards. Lightning 505 Power Supply – Our American-made power supplies are reliable, feature low noise outputs, and are backed with a 5-year warranty.